The Making of the Tombstone Survey. During the 1970s a dedicated group of volunteers set out to map the churchyard of St Andrew's, and to transcribe the names, but not the ages or relationships, of those recorded on the tombstones. The results of their efforts - monumental in more senses than one - are not in one unified document, but now another group hopes to amalgamate all the work that was done forty years ago. Meanwhile both the Museum and the Information Office have copies of at least some of the documents, available for personal inspection. Below is the background to the survey - not the survey itself. It ranges from a description of the flora and fauna, to the fashions in tombstone design, to examples of epitaphs. 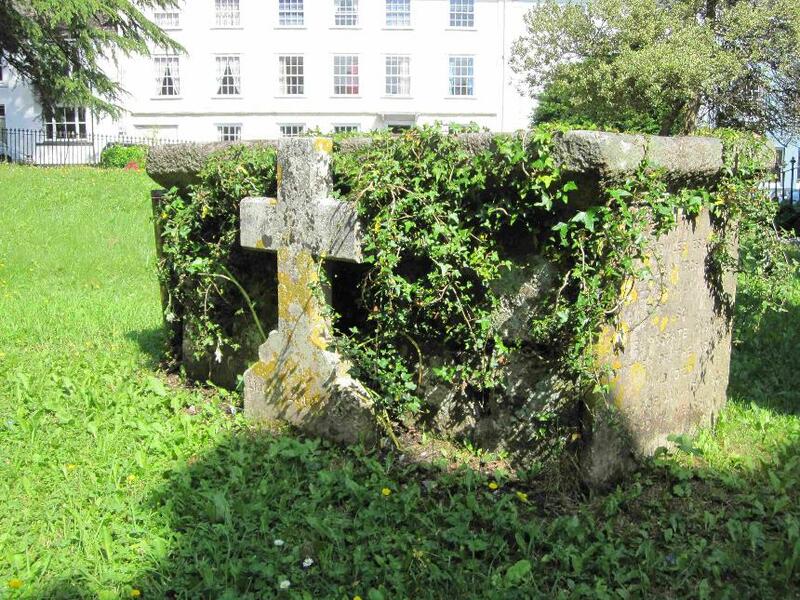 It also mentions a number of Ashburton people laid to rest in the churchyard. Very many thanks to Bob and Meg Heath and the Ashburton Museum, for allowing and enabling me to reproduce it here. Museum and can be inspected on request. to have been typed in circa 1981/82 after the completion of the Tombstone surveys. for us by Brigadier Shewell. 1 tanner, 2 tin miners, 3 watch makers, 3 wheelwrights, 3 wine and spirit merchants, 4 woolstaplers. the funeral his favourite grey horse was led immediately behind the corpse". But Miriam Adams was one of the workers who had a stone put up by public subscription in 1858.
good she did to all classes”. Nicholls killed at Owlacombe mine in 1841.
prospered on products of the sheep. From the family vaults we can trace the progress of the most prosperous families like the Caunters. known them. We find the next son John a JP, and living at Waye. MRCS, who died 1939, and George Hern, MRCS, LRCP, who died in 1935.
the other in the churchyard extension to himself and other members of his family. Worthy, after 18 years died in 1879. William Birch was Vicar from 1879 to 1900 and died in 1912.
and Prebendary of Exeter Cathedral, died in 1962. John Ball Lee, 1882. John Palk was clerk and sexton for 37 years and died in 1942.
of the Grammar School 1875-1915, and died in 1929.
conducted a musical and mathematical school in this town”. Foot the artist, youngest son of Peter Foot (above), died in 1908.
in 1810, and one was drowned when at Trincomalee with the Royal Navy. 1871 to Napolean III in Chislehurst, Kent, where he was then living. memorial stones in it. The church-warden’s accounts record charges for burials in the church. Above: Plan of the 'Old Section' Ashburton Churchyard. Many thanks to Bob Heath for supplying a copy of this. beautiful slates are used, ranging in colour from dark grey, through mauve to a delicate grey green. mostly by a headstone, no crosses, but there is a sprinkling of large chest tombs and family vaults. originally, it is hard to guess. It was a fairly careful if indiscriminate tidying up. O’er kinder parent, partner and true friend” . A man’s good name is his firmest monument”. Wait but awhile you’ll follow we”. flower, in Paradise can bloom”. breath”. And was it scarlet fever that killed Ann Marie Dennis, aged 4? And Christ has called me to the tomb”. leaving her friends and ONE ever deeply to lament her”. degree that it seemed right to mention it on tombstones, like John Woolaway, 1873. Till God saw fit to take me home, and ease me of my pain”. To meet old Death without a frown”. The mystery conveyed by Ann Badcock’s (she died in 1838) could inspire a detective story. All my secrets the world will know”. There is no one knows how I am blest, in the Divine Obscurity”. ‘While he addressed the people’s ears, his Master own’d the word”. Redemption through the blood of the Lamb, (and then in large letters), READER HAST THOU”? Oh, lift the heart in praise of Him who gave the Victory”. In 1873 died Thomas Rowland “who for 60 years blew the Gospel trumpet with a certain sound”. perfect peace”, “He entered into rest” or “Her end was peace” and “R.I.P.”. how about “English Game”, (alias “Cissie’)? Cedar, and the Thuja, the first now higher than the church. Amelanchier, Rowan, Holm oak, Portugal Laurel, and Cornus mas. of Lawson’s Cypress was planted along the boundary with Orchard Road. nest, and find safe roosts in the trees, there is even the winter shelter that tree creepers like. of scent from the winter heliotrope that is thriving among the emmett’s eels. The first data in the new Ashburton Digital Archive is now online. 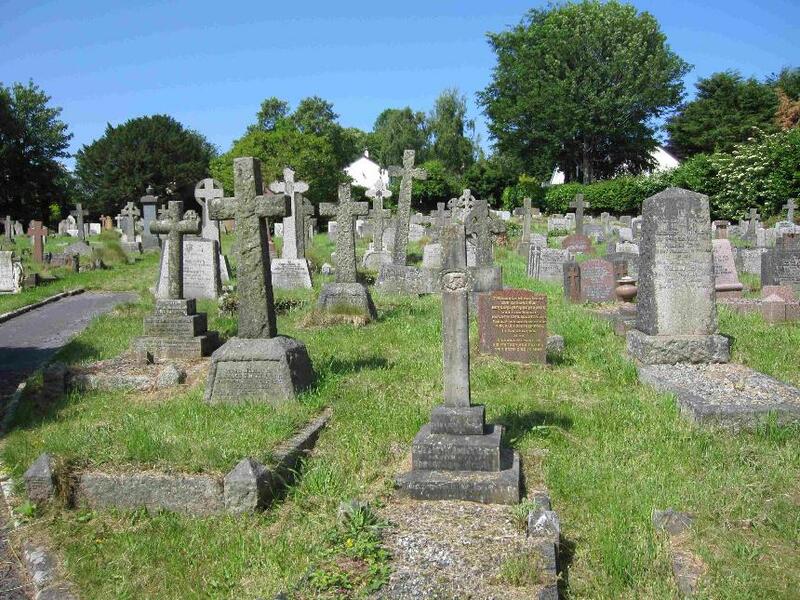 Begun as a project by the Ashburton U3A Family History Group, it currently holds all the memorial inscriptions for St. Andrew's Churchyard between 1956 and 1986.